Ecstatic we are to report our second shipment of trees has arrived safely. They flew into Nairobi, Kenya, courtesy of Cultivaris in Germany and National Tropical Botanical Gardens in Hawaii. With a little help from Trees That Feed Foundation too, of course! After being cleared at the airport they are hardened in a nursery then shipped out to point beyond, including farmers in Uganda and Tanzania. The photo shows a happy group of students and teachers at Chang’Ombe Secondary School in Tanzania. It’s quite a team that gets credit for this success. Joseph Matara of Grace Project in Kenya took the first steps. Mary Kibai in Kenya was caretaker of the trees. She transported them from Nairobi to Mombasa. Nick deKoning drove through the night to transport trees to Jinja, Uganda. Mary drove the trees into Tanzania, but they had t o be bare rooted first, because soil can’t be transported across borders. 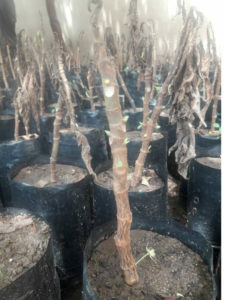 With instructions from Joseph Johnson in Jamaica, Saimon Mollel carefully nursed these young saplings back to life. The second picture shows those first few green shoots after these little trees had been on an 8 day journey. Hooray! Other people too numerous to mention have also contributed to this successful project. Many farmers, workers, volunteers, teachers, students, have worked together as a team. 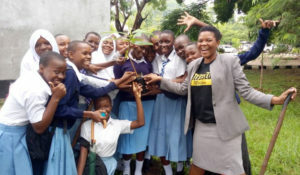 These nearly 3,000 breadfruit trees will bear fruit within 3 to 4 years and contribute to feeding tens of thousands of nutritious meals to students in Kenya, Uganda and Tanzania. This entry was posted in Africa, Blog, Breadfruit. Bookmark the permalink.